Do you hate the feeling of sticky vinyl or leather against your skin? How about stuffy upholstery with foam that just seems to trap heat and radiate it back to you? That line of sweat running down between your shoulder blades feels really icky – especially when you are only halfway through the workday. You know it’ll be another four or five hours before you can head home in the sweltering heat to hit the shower. 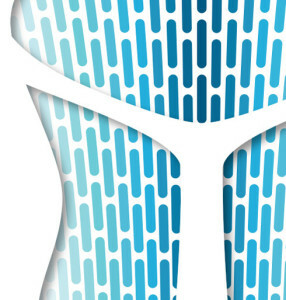 You probably find yourself wishing for a more breathable office chair. Louisiana summertime temps often spike into the nineties and the humidity can be awful. Herman Miller’s Mirra 2 chair “meshes” a semi-open polymer veined support structure with overlying fabric for a seat back that lets your back breathe. The textile is molded against the plastic webbing rather than being glued in place. This new way of combining materials apparently increases the airflow potential and temperature comfort since the fabric can flex freely with the movement of the user. The polymer grid is even more open and airy than in the previous Mirra model, offering superior ventilation. Steelcase’s Think chair with its 3D knit back is an obvious choice for maximum breathability. The seat back is light and flexible – you can even see through it. The back on the Think is suspended against thick cables (flexors) to provide support without adding bulk to the chair. 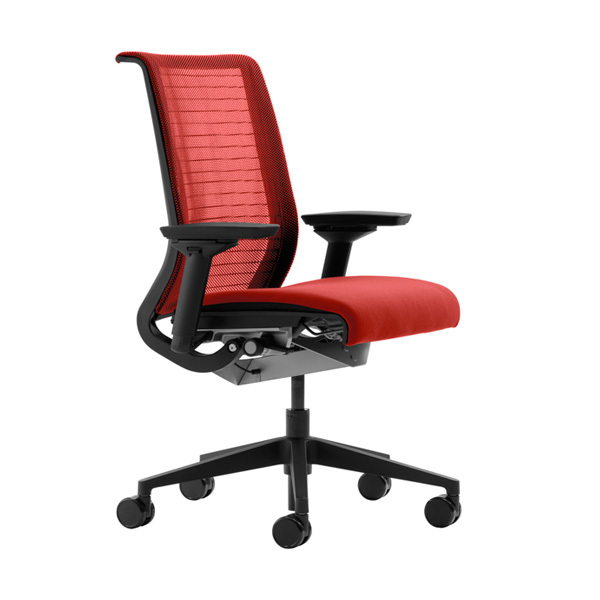 If you really do like an upholstered back for more comfort, the Leap is a nice upgrade. This chair features a breathable textile and foam combo with a slat back to allow air to move through. It blends the best of both worlds – and you’ll probably love the adjustable lumbar support. Want to do away with the seat back altogether? You don’t have to settle for a stool. 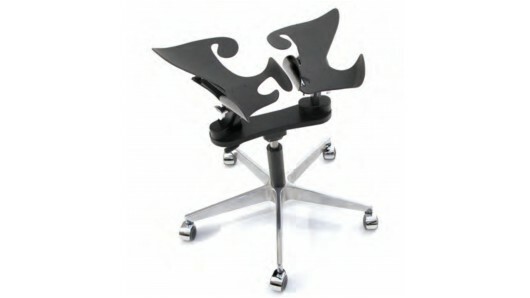 One very odd (and expensive) alternative is the LimbIC chair from Inno-Motion. It features custom fitted carbon-fiber shells that wrap around each thigh. You sit cradled in the air with complete freedom of movement and a strong incentive to maintain good posture. We think it might be a little breezy up there, but it sure looks fun. No matter when you decide to get more comfortable office chairs, Louisiana-based sourcing experts at The Office Planning Group are here to help. Office workers aren’t the only people who need great desks. New Orleans students at the Loyola College of Music and Fine Arts do too! We’ve already talked about the project we did for the law school that is part of the university. But our work didn’t stop there. The educational institution also had a need for furnishings in a new “music lab”. This is where students go to learn about music education, performance, the music industry, and much more. The university even boasts the third oldest program in music therapy in the United States. Of course, students in this setting need to get comfortable with using a keyboard. This is the go-to instrument for learning everything from music theory to rhythm, accompaniment, composition and much more. The stuff you can do with even an inexpensive Yamaha these days has to be heard to be believed! A benching solution on casters complete with data and electric management formed the core of the solution for this client. Comfortable task chairs completed the setup. 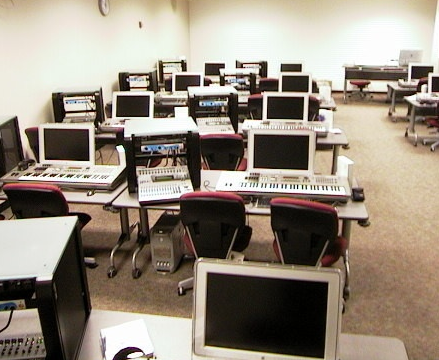 The end result gave the “Music Lab” a modern look that fits with the university’s cutting edge music program. If your educational institution is looking for desks, New Orleans’ premier Office Planning Group can help you hit all the right notes. The whirlwind of activity at NeoCon 2013 is over. The dust has settled, and the winners have been declared. At The Office Planning Group, we like to keep an eye on this event to see the newest office furniture. This week, we’ll review one of the top office desks that took home prizes for innovation and great design. These guys don’t bother coming up with a fancy name for their product. Their company name says it all – their product is a variable height desk. This item won the Silver award in the technology category. So, it’s actually not the ‘top’ office desk. Rather, it’s the desk you put on top of your desk. The company’s tagline promises that their products will “Change the way you work”™. If you’re used to sitting all day, that’s probably true. This design is the latest iteration in the height adjustable desk trend. It has a couple of benefits over previous styles from other manufacturers. It’s much less expensive than a whole desk or worktable that can be adjusted up and down (either manually or electronically). You don’t have to replace your existing worksurface, just clear enough space to set the VARIDESK on top. The inexpensive price point may put this ergonomic desk within reach for more business owners, and employees may display greater energy and productivity as a result. Unlike other desktop models, this piece doesn’t have to be bolted down. That means there’s no drilling or modification to existing office desks. It’s also flexible compared to other installed height adjustable desks since it can be moved from one workstation to the next. According to the manufacturer, the VARIDESK can be set up in less than five minutes. Basically, you just have to make sure the cords for all the peripherals are long enough to move without pulling. With just a squeeze, the desktop moves up or down and locks in place. 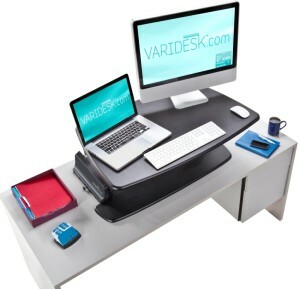 There are several sizes of VARIDESK to accommodate standard, dual monitor and laptop equipment configurations. The equipment even comes with an app that reminds the user when to switch from sitting to standing and back again. 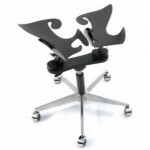 It’s a handy way to make sure your employees get your money’s worth out of their newest ergonomic accessory. Trains are a real blast from the past in terms of long-distance transportation. But they seem to be making a comeback due to the high price of gas. In fact, this “rail” way of getting from one place to another is quite romantic and can be a lot less stressful than navigating through traffic or worrying about car problems on a road trip. Of course, today’s trains are a lot sleeker and more comfortable than the steam engines of old. 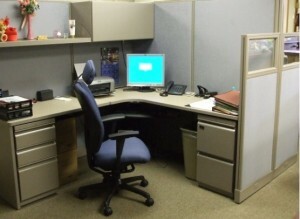 Along with that modernization of equipment comes the need for more updated office furniture. New Orleans AMTRAK location chose TOPG to revamp its space with furnishings that are a better fit for the electronic age. They wanted an office that looks as modern and efficient as the trains they help keep running. We used cubicle systems and modular furniture to achieve the look and feel this client was going for. Today’s cubes are a little more like passenger cars and less like box cars. They feature plenty of storage space for the “luggage” employees bring with them each day and for materials they’ll use at work. It’s not all glass and powder coated steel, though. In fact, wood laminate has come back into style in a big way (just like train travel is doing). So we were able to create a modern look throughout the office that will still look great in another ten years. 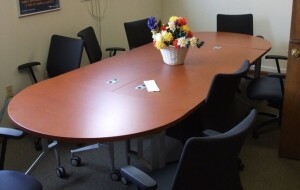 The conference table is particularly nice. It’s on wheels – something you don’t see every day. It’s a fitting homage to the train and also a great way to make a meeting room highly flexible. Another thing we like about the finished project is that there are flowers in every room. Check out the project showcase slideshow and see if you can spot them! Are You Humming Along Yet?